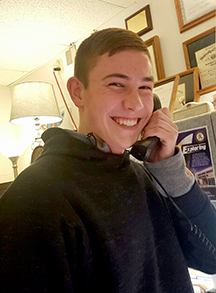 Pattonville High School senior Patrick Hachmeister has received an appointment to the U.S. Military Academy at West Point. He was nominated for the appointment by Congresswoman Ann Wagner, who called him at school with the news on Feb. 8. A nomination to a U.S. Military Academy is required to receive an offer of appointment from the academy, and receiving a nomination and an appointment are both rare accomplishments. In fact, Missouri’s 2nd Congressional District is one of the most competitive districts in the nation for academy nominations and appointments. 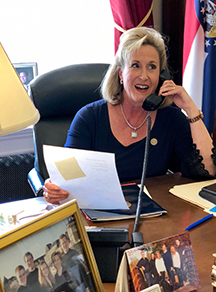 Wagner's office indicated it received 53 nomination applications from candidates representing 26 high schools throughout the 2nd Congressional District. Criteria used to select nominees include a "whole person" evaluation. Factors such as academic achievements, extracurricular activities, leadership skills, physical aptitude, character and motivation are taken into consideration and compared with the other district applicants and the academy guidelines. Patrick Hachmeister, left, is shown receiving news of his West Point appointment from Congresswoman Ann Wagner, right.